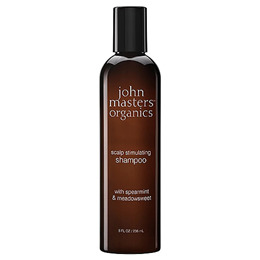 John Masters Organics Spearmint & Meadowsweet Scalp Shampoo contains six certified organic ingredients which remove build-up and stimulate the scalp, while soy proteins hydrate hair and lock in moisture. Spearmint & Peppermint - Stimulate scalp for optimal hair growth. Meadowsweet Extract (spiraea ulmaria) - Natural astringent; prevents hair loss. Eucalyptus Oil - Removes bacteria; anti -Inflammatory. Soy Protein - Strengthens hair follicle. Water/Aqua/Eau, Cocamidopropyl Betaine, Sodium C14-16 Olefin Sulfonate, Decyl Glucoside, Sodium Chloride, Citric Acid, Mentha Piperita (Peppermint) Oil, Sorbitol, Aloe Barbadensis Leaf Juice*, Mentha Viridis (Spearmint) Leaf Oil, Panthenol, Babassuamidopropyl Betaine, Sodium PCA, Gaultheria Procumbens (Wintergreen) Leaf Oil, Hydrolyzed Soy Protein, Spiraea Ulmaria (Meadowsweet) Extract, Tocopherol, Disodium Cocoamphodiacetate, Simmondsia Chinensis (Jojoba) Seed Oil*, Eucalyptus Globulus Leaf Oil, Smithsonite, Borago Officinalis (Borage) Seed Oil*, Hyaluronic Acid, Helianthus Annuus (Sunflower) Seed Oil*, Oenothera Biennis (Evening Primrose) Oil*, Linum Usitatissimum (Linseed) Seed Oil*, Potassium Sorbate, Sodium Benzoate, Limonene, Caramel. Wet hair, massage into scalp and leave on for 1-2 minutes, rinse. Below are reviews of Spearmint & Meadowsweet Scalp Stimulating Shampoo - 236ml by bodykind customers. If you have tried this product we'd love to hear what you think so please leave a review. 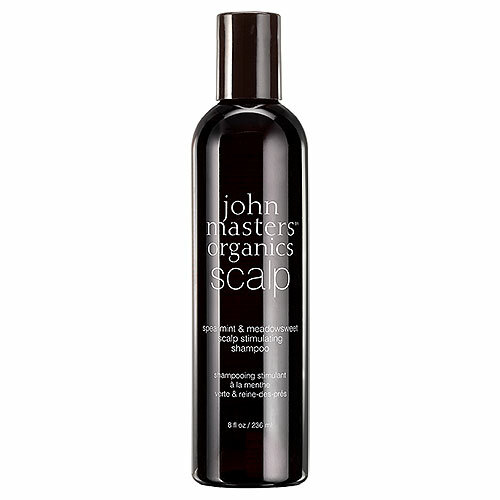 This shampoo is amazing for my fine hair, it gives a slight tingle feeling to the scalp and doesn't leave any residue. I received this as a free sample. It felt and smelt great. But it has two ingredients that are listed as a health concern (cocomidopropyl betaine and sodium benzoate). While the concerns about these chemicals are ‘low’, I really don’t want to be using products that have ANY risk to them - no matter how small. But if this doesn’t bother you, I’m sure you’ll be happy with this product. As I said, it did smell and feel great. Again just the right shampoo for my thinning hair.